Cameron at the Lake is a desirable townhome complex situated adjacent to Marston Lake, Pinehurst Country Club, and is within close proximity to all the shopping and dining available at the Southwest Plaza. This complex built in 1987 benefits from mature trees and landscape, maintenance free living, a clubhouse with a hot tub and pool. In addition, the HOA managed by MSI also provides sewer, trash, snow removal, exterior building maintenance including the roof, and maintenance of the grounds. There is an HOA restriction that doesn't allow investor or rentals prior to owners occupying the property. The 55 townhome units at Cameron at the Lake include 1200 to 1300 finished square feet and a 2 car attached garage. See what your Townhome is worth With an Instant Home Valuation Online. Want advice on selling your Townhome? We provide a free staging consultation, pre-listing prep plan, and a Cameron at the Lake real estate market analysis. Call us at 303-325-5690 to learn more. New to the Area? 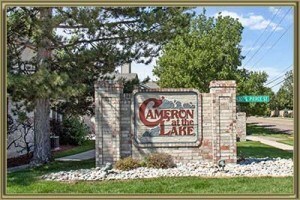 Call our Cameron at the Lake real estate agent at 303-325-5690 to schedule your tour of Townhomes in Littleton CO.